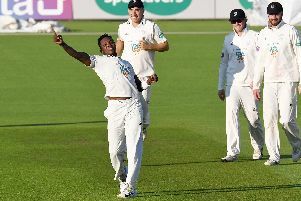 Fidel Edwards passed 50 wickets for the County Championship campaign as Lancashire were relegated on Tuesday. The Hampshire quick bowler took four for 72 as the visitors were bowled out for 273 on day two. They needed to post a first innings of more than 300 on their way to victory over James Vince’s side. But after Edwards blasted through the tail with the second new ball, Lancashire fell 27 runs short and were condemned to division two next summer. The visitors remained on top of the clash at the Ageas Bowl, though, as they reduced Hampshire to 178 for eight at the close. The home side lead by 92 runs with two second-innings wickets left. Lancashire will join Worcestershire, who were relegated last week, in division two next season. Rob Jones had given his side hope with a half-century on Tuesday morning. He added 84 runs with Dane Villas (27) for the sixth wicket – after Liam Livingstone (46) had been yorked by Edwards in the second over of the day. It was the former West Indies fast bowlere’s 50th scalp of the County Championship campaign. But after a classy 68, Jones departed two overs in the afternoon session when Ian Holland (three for 48) trapped him leg before wicket. Lancashire were still 59 runs short of their 300-run target at this point, with Joshua Bohannon and Tom Bailey joining forces to keep the score ticking over. But on 273, Kyle Abbott (two for 43) and Edwards (four for 72) returned to take the three remaining wickets and send the visitors down. Hampshire then continued to struggle on the bowler-friendly pitch. With a first innings deficit of 86, they lost Oli Soames (three) and Joe Weatherley (16) to new-ball bowler Richard Gleeson (three for 45). Jimmy Adams – in his final innings in first-class cricket – rode his luck before departing leg before wicket to Gleeson for 13. That saw the left-hander end his career on 14,145 first-class runs and given a guard of honour by his team-mates on his way back to the dressing room. Bohannon (three for 46) then removed Sam Northeast (11), James Vince (19) and Holland (four) to leave the hosts 88 for six. Liam Dawson and Lewis McManus added 43 for the seventh wicket to offer hope of a recovery before the former was caught down the legside for 37. Gareth Berg (four) departed cheaply before Abbott and McManus, who will resume 30 not out, guided Hampshire to the close eight down.